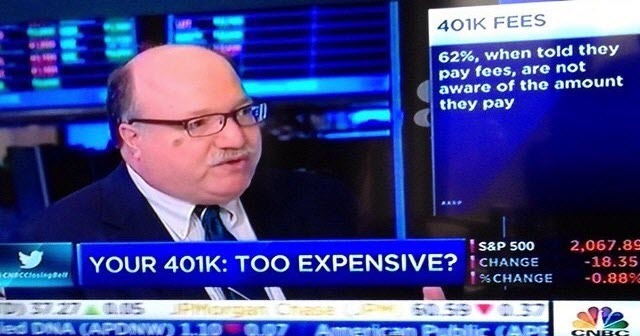 Chris Carosa was writing about fiduciary issues in retirement plans long before it was popular, he is one of the greatest sources of 401(k) news on the web. So it was fun to turn the tables on him and get his insight on what’s going on in the retirement plan world. A: A better question might be “How did I get my starting in the investment business?” That, after all, came first. [Warning, this journey starts a little morbid.] As a kid, I wanted to be a race car driver. Then, while watching a race, I saw an accident that proved fatal to the driver. I decided I should try something safer, so I picked another profession. It was second grade and the classroom had one of those Rand McNally poster maps of the solar system posters displayed on wall. Its brilliant color and 1950s-style artist renderings that bordered the Sun and the planets caught my eye. I knew what I must be: an astronaut. Well, there was this fire in the early days of the Apollo program that killed three astronauts. It turned out this astronaut things could be just as deadly as driving race cars. I had to pick another career. I still liked space, so I went with “astronomer.” I read all things “astronomy.” I took adult level astronomy classes at the local planetarium. I even taught myself the mathematics of Lorentz transformations (for the curious, that means mass and time dilation, the stuff from Special Relativity that sci-fiction writers rely on to justify time travel in their plots). Yeah, you may call me a nerd. I was even captain of my high school’s Chess Team. Yet I was also a kid. I liked sports and, without my parents’ knowledge, secretly bought (i.e., “invested in”) football and baseball cards with money that I should have used to pay for lunch. (I skipped lunch and went into the music room instead, where, having nothing otherwise to do, proceeded to learn how to play the piano.) Very quickly, and totally unrelated to tickling the ivories, I discovered there was a secondary market in sports cards. An increasingly lucrative market as all those 1950s kids now had real jobs and money to spare. I became a dealer. My best investment was a trade of ten then current (1970s) baseball “superstars” for a rare 1963 Topps rookie card of Pete Rose. At the time, both the ten cards I gave away and the Rose rookie card were valued at $200. Today, those “superstar” cards are worth about $10 while the 1963 Topps Rose rookie card goes for about $10,000. To think, I was practicing behavioral economics before I knew what it was. Naturally, despite spending four years studying physics and astronomy at Yale and being awarded a graduate fellowship to pursue a PhD in Astrophysics, I opted instead to take a job on Wall Street upon graduation. Unfortunately, the year was 1982 and I got laid off from the job before I had a chance to start (and before I graduated, but, unfortunately for me, after I told Boston College they could give the fellowship to someone else). It took six months of desperately searching for any job in any industry to find employment. As luck would have it, I landed a position at Manning & Napier Advisers, Inc., the leading investment adviser in the Greater Western New York (i.e., as-far-away-from-New-York-City-and-still-be-able-to-say-you-live-in-New-York-State) region. Mind you, I wasn’t hired to do anything close to picking stocks. I was actually brought on as “computer coordinator,” but don’t be too impressed by the title. I was essentially a glorified data entry clerk. Each morning I would arrive and type in the relevant data from the previous day’s trades, print out authorization letters, then package them for mailing to the respective custodians. After that, the data sat dormant – it was the epitome of a dead-end job. Anyways, from there I went to MIS Director, to Managing Director of Operations, to head of the Custody First Division, to EVP and Senior Trust Officer of Exeter Trust Company. It was as a trust officer that I first learned all things “fiduciary.” That wasn’t limited to retirement plans, but I did focus on packaging trust services (e.g., “directed” vs. “discretionary”) for 401k plans. In addition, I came up with a reasonable way to refashion Manning & Napier mutual funds into collective investment trusts so 401k plans could access pooled investment vehicles at a much reduced cost compared to selecting mutual funds. This was in the 1990s, so it took a lot of convincing people (both at the firm and with the clients) to swim upstream against a strong current sending 401k plans into an ocean of mutual funds. But, hey, I was only trying to do what was in the best interests of plan participants. Q: Many people recognize you just from FiduciaryNews.com, but you have a vast experience in the financial side of things including creating mutual funds and starting a trust company. What have been your other accomplishments besides your writing? A: If you thought my life before Manning & Napier was eclectic, wait until you hear about my doings at that firm. I’m pretty sure, after twenty years, the statute of limitations has expired. As I said, I started at this really low level position. It was one of those “I’ll take anything I can get paid for but I’m going to get a ‘real’ job in six months.” I did. Only the ‘real’ job wasn’t for a different company. Bill Manning was kind enough to trust his firm’s future growth to a twenty-two year old kid with only one formal class in programming (Fortran, it’s what science guys had to learn back then). So I was tasked with designing, from scratch, a centralized computer network using an integrated portfolio management system. I reverse engineered the latter (after picking up COBOL in some back alley). But that was small potatoes compared to what happened next. As the firm grew (my assignment was to create an information system capable of doubling the capacity of the firm), I hired a staff to handle the “everyday” stuff while I dabbled on the edge. I picked up a few books and, with them, just enough knowledge of C and Prolog to make me dangerous. At this point, I began to focus more on the PC landscape and less on the mainframe (a.k.a. “mundane”) environment. The company had just hired a leading analyst intimately familiar with academic research involving “Diminished Expectations Theory.” This was an early form of applied behavioral economics. Its use could be optimized by applying it to huge data bases filled with up-to-date company financials. I used C for the databases and Prolog for the artificial intelligence. Now, using AI in the mid-1980s outside the academic world was unheard off. It turns out the kind folks at the Wall Street Computer Review magazine heard and promptly featured me prominently in a cover story for one of their issues. At the time I didn’t realize you needed to clear these public relation things with your boss. I got in big trouble. Any fear they may have instilled in me fell by the wayside as soon as I learned the marketing department bought a large box of reprints of that cover story for use in their promotional materials. As you mentioned, I played an important role in developing Manning & Napier’s mutual funds. Again, this was before I began venturing into portfolio management. I was the “operations specialist” that had to make sure everything worked. It so happens when you focus on mutual fund operations, you learn where all the skeletons are hidden. This certainly has helped in my reporting and differentiates me from the typical journalist who doesn’t have experience in the field. More immediately, this experience proved essential when I went off to start my own RIA. I should note I left Manning & Napier on friendly terms. I wanted to write a book. But as the outline (not the manuscript) approached 150 pages, I realized writing wasn’t going to feed my growing family. With our third child on its way, I did the math and concluded I needed a more reliable source of revenue. And I needed it quick. There was only one thing I knew I could do quickly and get paid for, and that was investment management. I had been one of the managers a private investment partnership with my classmates for almost a decade, so I approached one of the partners – Gordon Stanton – and asked him if he’d be interested in started a registered investment adviser. He said “yes” and Carosa Stanton Asset Management, LLC was born twenty years ago in November 1996. One of the first items on the agenda was converting the partnership to a mutual fund. I had this ongoing debate with the CFO of the Manning & Napier funds that it was possible to slash operating costs and lower the expense ratio of the funds. (After all, wasn’t that in the best interest of the mutual fund shareholders?) He never believed I could do it. Now I had a chance to prove it. I saw Forbes had just run a piece on a guy who operated a mutual fund out of his basement, so I called him up and paid him $400 for a morning meeting. My objective was to convince him to work as a consultant to help me set up my fund. When, after four hours of probing how he set up his operations, I asked him how much it would cost me to hire him. He said I didn’t need him and then told me the average person that hired him was a securities analyst who knew nothing of operations. I was that rare bird who had actual operations experience. So did my theory of low cost mutual fund operations work? Put it this way: At the time, the typical cost of starting a mutual fund was $150,000. I did it for only $7,500. Same with the ongoing costs. The typical fund had about $150,000 in expenses. Ours had only about $12,000. This created a vastly different mutual fund business model. We used it to add more Series to our fund. It has allowed us to operate on a sustainable basis for nearly twenty years when most funds our size wouldn’t last more than a few years. I should tell you something about that second Series. The first series was a straight-forward multi-cap value fund. The second series was a regional fund focused on companies with a significant economic presence in the Greater Western New York region. We created it to promote our much maligned region. Just after the fund started, the New York Times ran a story on it in their Sunday Business section. I was so proud – until I read it. The piece started off with “dilapidated grain elevators” and “rusted out steel mills” and ended with a tongue in cheek “go Bills.” My heart sank. Then I started getting all these excited calls saying good things. You know what they say about “no publicity is bad publicity”? In this case it was true. It was also true that less than five years later the Greater Western New York Series found itself on the top of the list of best performing funds in the nation. I called the New York Times reporter to see if she was interested in doing a follow-up. I’m still waiting for her to return my call. But, all kidding aside, my biggest accomplishment is my family. Q: How did you make the addition of writing to your vast wealth of experience in the financial industry? A: Truth be told, the writing came first, and quite by accident. I was one of those science geeks in high school that absolutely hated English class. At one point I “unionized” the Advanced Placement English students and led them on a brief “strike” where we picketed the class. But there’s a more interesting story – one that may reveal the answer you’re looking for. In tenth grade the teacher gave us a project where we had to read a novel and right an analysis of it. I convinced about a third of the class to protest this “impractical” assignment. The teacher was cool. He told us we didn’t have to do it. We thought we “won,” however, he quickly added, you have a choice: Either write an analysis of a novel you read; or, write your own novel. All the other students gave in and went with the original assignment. I chose to write a novel. Remember how I left Manning & Napier to write a book? It was to be a book titled “The Seven Deadly Sins of Professional Money Managers.” The outline was too long to make into a book, but I did take one of the chapters and wrote my first book Due Diligence (unfortunately, the publisher went out of business and the book is now out of print). Following that experience, I gave up on book writing and concentrated on the RIA. That didn’t mean I stopped writing. In 2005 I submitted a paper to the Journal of Financial Planning’s annual Call-for-Papers competition. Entitled “The Emperor Exposed,” it showed how changing the frame of reference of performance time periods proved index funds did not consistently beat actively managed funds. The paper won the prize under the academic research category and, as you might expect, generated a lot of controversy. The paper, to my knowledge, was also the first to introduce the concept of the “Snapshot-in-Time” performance anomaly. Getting back to Due Diligence, I wrote that for individual trustees. It came from my experience running the trust company and is the basis for much of the fiduciary writing I have done since. I started FiduciaryNews.com as an on-line trade journal with the idea of providing essential guidance to ERISA plan sponsors. I quickly learned ERISA plan sponsors don’t spend a lot of time reading on-line trade journals, at least ones dealing with being an ERISA plan sponsor. On the other hand, ERISA plan service providers – and regulators – were very interested. Rather than throwing in the towel, I accepted and embraced this audience. And I’m happy to say they’ve appeared to have returned the favor. Lately, readers have been asking me to help them improve their businesses, given all the changes we’re seeing. This isn’t “fiduciary” consulting in the investment advice sense (that could only be delivered by the RIA. This is a separate and distinct business and management consulting service line being offered through Pandamensional Solutions, Inc., the parent company of FiduciaryNews.com. It turns out, when you talk to a lot of movers and shakers in the industry, people want to pick your brain. This has been a pleasant and unexpected surprise as a result FiducairyNews.com. I enjoy speaking to other financial professionals to help them make their own businesses more successful. Q: You’ve been writing for FiduciaryNews.com since 2009, what have seen to be the biggest changes in the retirement plan business since that time? A: Well, the biggest change is that I’m not the only one talking about fiduciary issues. That’s a bit immodest, but I think part of the success of FiduciaryNews.com is that it was the first on-line trade journal to focus on the area of “fiduciary.” As the issue grew in relevance, it became the “go to” site for people interested in the topic. Since then, we’ve seen several dramatic changes in the retirement plan business. First, the nature of 401k plans have evolved to where they are more savings-centric rather than investing-centric. This shift has been boosted by the growing acceptance and incorporation of behavioral finance techniques. Some of the more popular articles in FiduciaryNews.com address what I call the “21st Century 401k Plan.” Among the most well-known examples include auto-enrollment and auto-escalation. This is that part that’s easy for most service providers to understand. On the other hand, there’s also a movement away from Modern Portfolio Theory “style box” investment menu options towards “category-based” or tiered investment menus. This one is a little bit more nuanced and requires a smidgen of study and practice to attain a degree of mastery that allows the service provider to successfully explain the value this adds to the plan sponsor. Finally, education has moved from “investment basics” to “retirement readiness.” Again, this emphasizes savings strategies rather than investments. I believe this was fueled in part by a Wharton study that suggested of the four components of a successful retirement, the investment strategy mattered least. Again, this may sound straight-forward, but there are ancillary aspects to implementing this education process required to successfully persuade retirement savers to make decisions that are in their best interests. Another big change is the attitude regarding fees. I do have a concern that the pendulum might be swinging too far in this area. It’s important people distinguish between fees that matter and fees that don’t matter. Clearly, the fees that matter are the conflict-of-interest fees. The DOL’s fee disclosure regulations don’t go far enough in both exposed these fees and differentiating them from other fees. At this point, my fear is that we are undergoing a “race to the bottom” as several prominent industry thoughtleaders have warned. Finally, we have the Fiduciary Rule itself. A few years back, if you Googled “fiduciary,” most of the top links would refer to FiduciaryNews.com. Today, there’s a lot more diversity on the last. The term “fiduciary” is now firmly planted in the lexicon. This poses a challenge for a writer like me who is always searching for the coming thing. It used to be easy to write about fiduciary topics because they were so new to everyone. Today, uncovering the next “new” topic represents a much higher hurdle than it used to be. Q: How do you think the new fiduciary rule will impact the retirement plan business? A: The DOL’s new Conflict of Interest (a.k.a., “Fiduciary”) Rule, whether it survives or not, has already impacted the retirement plan business. Even before implementation we’ve seen major brokerage firms taking different sides on the issue of conflict-of-interest fees. Furthermore, they’ve already begun to introduce “fiduciary” into their marketing campaigns. So, you see, the inertial momentum is now too great to stop, even if the Trump administration, as expected, rescinds the Rule. One of the areas the Rule has already exposed – and you’re seeing this now – is the fiduciary liability that comes with conflict-of-interest fees. We see class action attorneys going after service providers – namely, recordkeepers – who they claim have breached their fiduciary duty as a result of these conflict-of-interest fees. The Fiduciary Rule has let the cat out of the bag, and it’s not going back in. I don’t think the DOL ever figured it would enforce the Rule. I think they expected the tort bar to take care of that. In releasing the final language of the Rule, they have provided the theoretical framework for private attorneys to make a legal case against those who participate in conflict-of-interest fees. More so, it’s put 401k plan sponsors on notice that these conflict-of-interest fees will only get you in trouble, so you better make sure you’re not exposing plan participants to them. Q: Many industry advisors are predicting gloom and doom for the Fiduciary Rule, do you agree? A: As you might guess from the above, I don’t think it matters one way or another if the Fiduciary Rule is actually implemented. It’s already baked into the cake. If not the Fiduciary Rule itself, it will be the ghost of the Fiduciary Rule that will haunt the retirement plan industry. At this point, the popular parlor game is to guess exactly how Trump will dismantle the Rule. The consensus appears to be that he will delay it and reform it. I think that’s being too charitable. If you read the tea leaves – and read The Art of The Deal – you can make a good guess as to how it will happen. First, while all those around him decry the Rule, Trump himself has said little to nothing about it. What he has said is that he doesn’t like regulation. One could interpret that as being bad news for the Rule. However, for a guy who’s not afraid to call out Ford, Carrier, Boeing, and just about every major media outlet, why wouldn’t he do the same for the Fiduciary Rule if he wants to get rid of it? The answer is simple: Why give away something for nothing? Trump wants a lot of things, and, to him, those things have a much higher priority than ridding the world of the Fiduciary Rule. Others in Congress have different priorities. For many of them, ending the Fiduciary Rule is one of them. They may not share some of Trump’s highest priorities (think the “Wall,” tax cuts, and ending ObamaCare). It might just be Trump realizes this, so he’s keeping the Fiduciary Rule in his pocket as trade bait to get what he wants. Q: First, fee disclosure regulations, Second, came the new fiduciary rule. What do you think will be the next big deal in the retirement plan business? A: In terms of the most immediate future, the battle lines are already shifting from the Fiduciary Rule to state-run retirement plans for private employees. Unlike the fiduciary fight where members of the industry took opposing sides, the state-run retirement plan issue has the potential to unite the industry (and possibly heal their fiduciary wounds). In this, expect the industry to have a strong ally in the Trump administration. Here’s the key: Remember what Trump said about health care. From a business perspective, providing health care across state lines is problematic. He’d like to see health insurance move out of the individual state’s jurisdiction so private insurance companies can more easily cross state lines. Now, imagine if each state can come up with its own rules for retirement plans. That will create a mess for retirement plans just like the mess we currently have for our health insurance. Q: Do you think plan sponsors understand their fiduciary duty more than they did a few years ago? A: All this talk of “fiduciary” may have nudged plan sponsors a bit, but the needle hasn’t moved that much. Sure, industry groups representing plan sponsors have expressed concern, but those folks always know “inside baseball” more than the rank-and-file plan sponsors. I don’t think plan sponsors will take notice until they get an offer they can’t refuse. I’ll address that in a later question. Q: You’ve interviewed EBSA head Phyllis Borzi a couple of times. What do you think her impact will be on the retirement plan industry? A: Phyllis Borzi is a fiduciary hero. She’s been very kind whenever I’ve spoken to her. In my discussions, I can tell she’s always known more than she might let on. I do think the administration, for whatever reasons but probably to appease opponents of the Fiduciary Rule, lowered her profile once Tom Perez arrived on the scene. I don’t think that was fair to her, but I’m glad to see she’s been able to take a “victory lap” following the release of the final Rule. I think she’s been diligent in her efforts and much of that conceptual framework of the Rule more than likely came from her. Think of it like a Trojan Horse for certain retirement plan service providers. In many ways the Rule appears to be a gift to the industry – at least those who opposed the fiduciary standard. By relying on disclosure and not actually banning conflict-of-interest fees, the Rule appears to permit brokers to continue with their conflicted business model and still call themselves “fiduciary”; thus, eliminating the one differentiating characteristic their competitors currently possess on an exclusive basis. But here’s the thing. This is where those class action attorneys come in. Even if it stays intact, we won’t know the real impact of the Fiduciary Rule until it is tested in court. With the Rule, brokers have the legal leg of disclosure to stand on. Without the Rule, they lose that legal leg, but, again, now that the cat is out of the bag, they don’t lose the fiduciary liability. Either way, it will be the courts that decide the lasting impact of the Rule (or the Rule’s ghost). Q: What do you think of the impact that states will have in offering their own 401(k) multiple employer plans? A: I think this will be DOA as soon as congress passes legislation allowing open MEPs. The states can’t compete against providers that offer the ERISA protections the state’s don’t want to offer. That won’t prevent the states from offering their own plans. And this could be problematic if the state mandates employees join these programs even if they don’t want to. It’s likely the only way to prevent this from becoming a mess is for the feds to step in and require the states to abide by ERISA. And allow employees to opt-out. Q: Where can someone find out more information about the work you do? A: The best way to contact me is through FiduciaryNews.com. Just go to “Contact Us” on the top Navigation Bar. I’m available for keynote speaking at industry conference and for non-investment related consulting. And, if you don’t have one already, be sure to buy a copy of 401(k) Fiduciary Solutions.